OOOOH WEEEE, MAC & CHEE!!! There’s nothing we love more than taking the foodie treats of our youth and revamping them into something a bit more ‘grown up’. Case in point – Macaroni & Cheese. (Or as we lovingly refer to it in our house – Good Ol’ Mac & Che) When we were below 4 feet in height, all it took was the promise of “The Cheeseiest” courtesy of Kraft on our plate and we were on our best behavior the whole day through. Although we’ve been known to still enjoy the blue box’s nostalgic goodness from time to time, our palette has grown along with our height and has definitely diversified through the years. Cut to our new found love of Savory Cupcakes and this post is all about our favorite, The Mac & Che Cupcake. Ready to scratch your kiddie itch on-the-go while still pleasing the gourmet foodie you’ve grown into? Then Let’s Do The DIY Thang, shall we? First up, is the Prep…which in this awesome recipe will be in 2 parts. Optional Extras: These are a few add-ins that make an already delicious treat that much more scrumptious. First, pre-heat the oven to 350 and line the cupcake tin with the foil liners. If there’s paper inside the liner, definitely remove it…unlike cake, the paper sticks like glue to noodles) Then, mix butter and breadcrumbs from Prep 1 until fully blended then set aside. (Since this will be the crumbly topping, you can customize it by adding one tbl of cayenne pepper, ginger, tony chacheres or your favorite spice to make the topping extra special.) Now on to Prep 2: Cook the macaroni, not forgetting oil in the water. (MUY IMPORTANTE) Then drain, leave in the pot and set aside, but stir occasionally so the macaroni wont stick together. (Which is why the oil is so muy importante) Next, melt remaining pats of butter in the skillet and then add the onions. Sauté on Medium heat, until the onions are clear. Stir in the Flour with a whisk until fully mixed and then slowly add the Milk so that it doesn’t get lumpy. When fully blended, then add in desired extras (bacon, ginger, etc). Mix well and then bring to a simmer, stirring occasionally so it doesn’t burn. Once thickened, take the skillet off the heat and add cheese, one cup at a time, making sure it’s fully mixed before adding the next cup. After cheese mixture is fully blended, fold cheese mixture into the macaroni pot, stirring well until macaroni is completely covered. Next, using a ladel, scoop the fully-cheesed macaroni goodness into the individually lined cupcake tins. Sprinkle the breadcrumb mixture on top of each ‘cupcake’ and bake in the oven for 20-25 mins or until the breadcrumbs brown. BAM! You’re personal sized Mac & Che cupcakes are ready to be devoured! Thanks to their foil liners and individual size, these savory Mac&Che cupcakes are perfect for potlucks and portion control alike…even if the longest distance it makes is only from the kitchen to your plate. Unlike the blue boxed wonder of our youth, this recipe is fully customizable and allows for adaptation for any reason – dietary issues, kosher keepers, meat lovers, spicy food haters, etc…etc. Speaking of meat lovers, you can make them extra happy by greasing up the muffin tins and lining them with slices of prosciutto instead foil. Want to make this tasty treat for the masses? Skip the cupcake tins altogether and pour the Mac&Che mixture into a 2qt casserole, add the crumbly topping and bake as usual. Pumped with a lifetime of gourmet nostalgia, goodness this delicious is worth the hefty calorie count that comes right along with it. Just make sure to keep your hands out of the way when it comes time to serve. No one wants to lose a pinky for a few cheese-covered elbows. 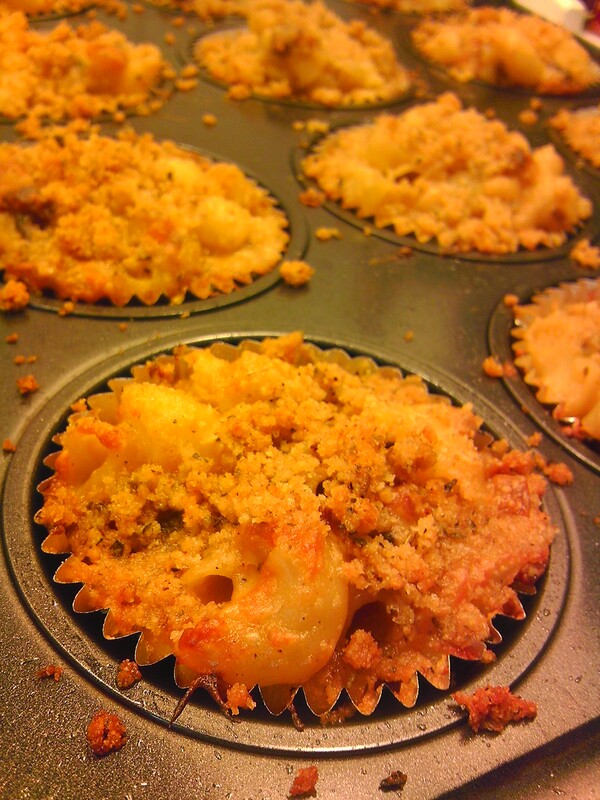 2 responses to Savory Mac & Cheese Cupcakes, Please!